This is my second gorgeous nail polish from my favorite online shopping website "Born pretty Store". If you are an avid reader of my blog, you would have checked my post on Born Pretty Store Holographic Nail Polish! 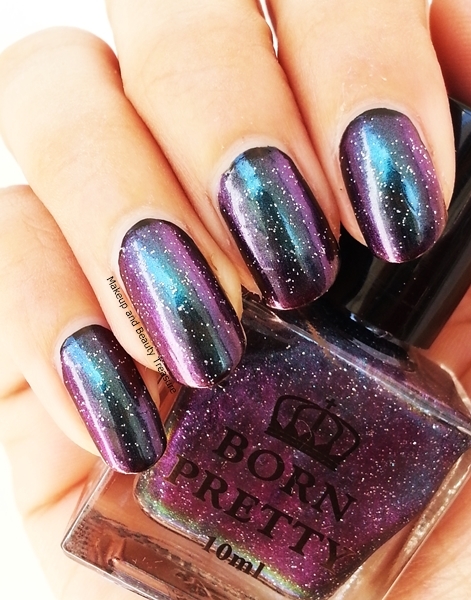 Today I am going to review Born Pretty Store Chameleon Nail Polish* which is very similar to holographic nail polish! I got the shade #02 that gives an effect of purple, blue and black when light falls over the nails! Use the coupon code MEGW10 to get 10% off on your order! There are a total of 5 shades to choose from and I must say all are super gorgeous! I chose the shade #02 as I am fond of dark nail colors! The nail polish actually comes as a set. You get the chameleon nail polish and a black nail polish as a base coat! The chameleon nail polish is basically a top coat that has to be applied over a black nail polish! I was pretty happy that the brand is thoughtful enough to give the black nail polish along with the chameleon nail polish! Before applying the black nail polish as a base color, make sure you apply a base coat to prevent your nails from getting stained! The black nail polish is super pigmented and gives awesome coverage with a single coat! After it dries, apply the chameleon nail polish! The bristles of the nail polish are of good size and apply nail polish smoothly without streaking! The chameleon nail polish also contains fine silver glitters that makes it all the more glamorous! I apply 2 coats of chameleon nail polish to get that glam effect! You can apply a top coat to make it last longer! 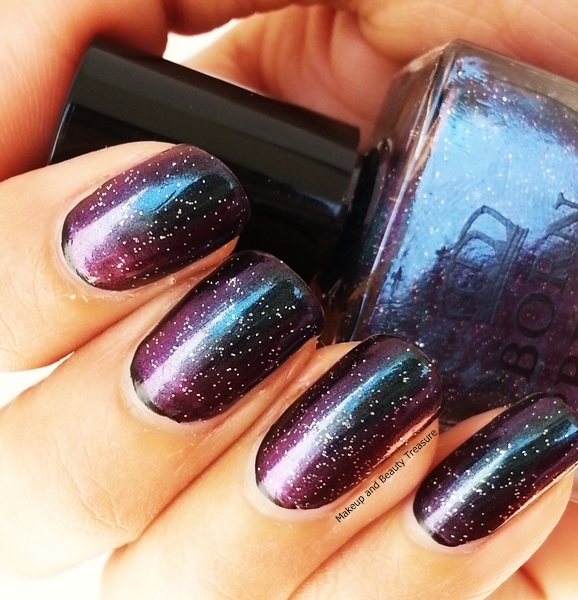 I find it pretty similar to holo nail polishes from Born Pretty Store. It changes color when light falls on my nails! It is indeed one of the best nail polishes I own and can be paired with all outfits! It is an awesome nail color when you are planning to go to a party or a function! - Shines even without light! 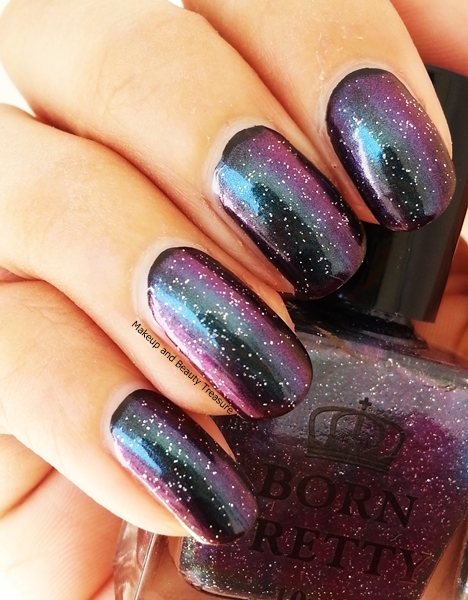 - Perfect nail polish for party time! - You get 2 nail polishes! - Looks extremely gorgeous on hands! - The color suits all skin tones! - Reasonably priced for 2 nail polish and the quantity is good too! If you love trying new nail polishes that instantly makes you feel glamorous and dressed up, then I would highly recommend you to try Born Pretty Store Chameleon Nail Polishes! They look elegant and beautiful on nails! Have you tried chameleon/ holographic nail polishes? Wow, this nail polish is really great, I love the shine and the color too. Your review is quite complete, thank you for presenting this product to us. Your blog is very nice, so I am following you on GFC and google+. Thanx a lot for the appreciation Flo! :) have you tried these kind of nail polishes?